Voting matters. Though many Americans believe that voting is either useless or merely a civic duty, in reality it carries huge consequences for the decisions of politicians. There is overwhelming evidence that politicians are more responsive to the preferences of voters than non-voters, and that voting affects government policy. These facts have key implications for policies that disenfranchise individuals who would otherwise vote. Indeed, America’s racialized voting practices continue to disenfranchise the poor and communities of color, robbing them of billions in public funding. In a pioneering 2013 study, Elizabeth Cascio and Ebonya Washington examined how the elimination of literacy tests, after the passage of the Voting Rights Act of 1965, affected the distribution of public spending. They find that removing literacy tests increased per capita state transfers by 0.57 percent for each percentage point increase in the Black population share. This equates to a 16.4 percent relative increase over the 20 year period they studied for the average county, a large difference. They find that a key change was educational spending: removing literacy tests lead to more spending directed at Black students, a better pupil-to-teacher ratio and higher Black school enrollment. This study is supported by other research suggesting that women’s suffrage lead to increased spending on healthcare, which prevented 20,000 child deaths each year. A 2003 study by Paul Martin finds that members of Congress push more funding towards districts with higher voter turnout. The effect he finds is not small. He provides as an example Grant County, which had a population of 30,000 received $18,030,000 in federal grants in 1994. Each percentage point increase in turnout would have boosted spending by $21,420. Today, literacy tests and poll taxes are banned (though voter ID laws are often essentially poll taxes), but states can still disenfranchise felons. Because of race and class disparities in the criminal justice system, the impact of disenfranchisement hits communities of color and low-income communities the hardest. We would expect, for example, given the studies above, that felon disenfranchisement would reduce spending for communities disproportionately affected by mass incarceration. And a new study by Brice Richard confirms this, finding that the impact of disenfranchisement is profound. Richard finds in particular that an extra percentage point of voter turnout leads to a 2 percent to 3 percent increase in per capita spending. The chart below shows that turnout is lower in disenfranchising states, and that state to county transfers are also lower. 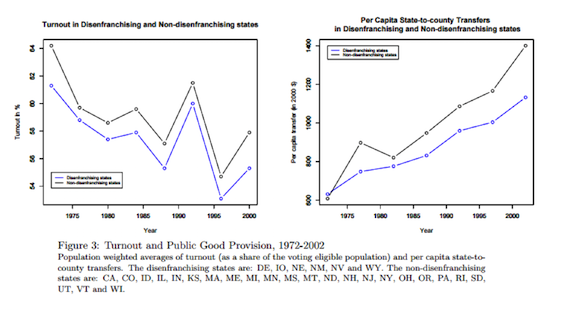 By exploiting the differences in disenfranchisement across states, he finds that disenfranchisement may have reduced public spending by as much as 18 percent. The total impact of disenfranchisement is $1.8 billion in public goods that otherwise would have flowed towards high poverty communities and those with large Black populations. The impact is particularly strong regarding education spending; Richard estimates that each child in a disenfranchising state lost out on $640 in educational spending, with the impact concentrated on Black students. 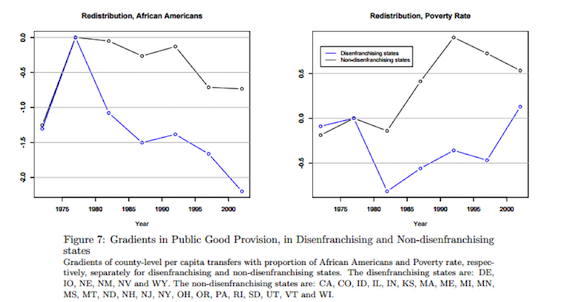 As the chart below shows, transfers to Black communities and poor communities is far lower in disenfranchising states than non-disenfranchising states. One possible reason why the effects of disenfranchisement are so powerful is that voting tends to become a social norm. Voting correlates with other civic behaviors. Being socialized in a community where voting is the norm increases an individual’s propensity to turnout. Indeed, in households where parents vote, children are more likely to. If a household receives a get-out-the-vote message, the member of the household that does not answer the door is more likely to vote than otherwise. Disenfranchisement then, will reduce the social norm for voting, potentially having effects beyond only the individual who is disenfranchised. Disenfranchisement is not the only mechanism working against the Black vote. In another study, four political scientists showed how premature death among the black community robs them of important political clout. They find that premature death led to 1 million fewer Black votes in 2004, and while this wouldn’t have changed the outcome of the Presidential election, it would have affected state-level races. This premature death is the legacy of white supremacy and racism. In addition, Nathan Cohn has found that the legacy of Jim Crow has continued: African-Americans who were disenfranchised before the Voting Rights Act make up a smaller share of the electorate than younger African-Americans. In a recent analysis, I found a strong correlation between the level of racial stereotyping in a state and the likelihood of the state having a voter ID law. 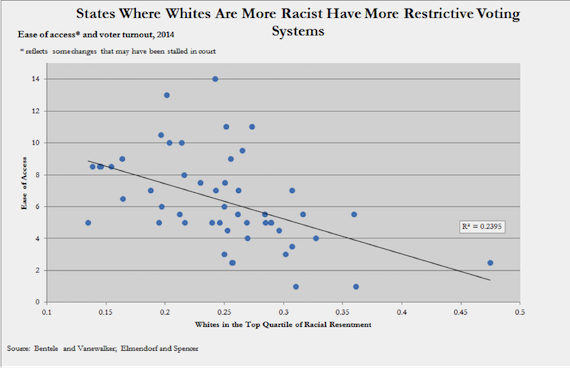 I also found a correlation between racism and the openness of the voting system. I’ve also shown that ease of access is correlated with turnout, which isn’t surprising: numerous studies suggest that policies like same-day registration boost turnout. The impact is obvious: racism suppresses voting, meaning that less government spending goes to communities of color and low-income communities. Many disenfranchised felons face a second blow: prison-based gerrymandering. In this practice, prisoners (who can’t vote) count toward the population of the area where they are incarcerated which affects how districts are drawn. Research suggests that when districts are drawn unequally, public funds are distributed unequally. In the wake of Baker v. Carr (which allowed federal courts to intervene in districting to protect the principle of “one person, one vote”), public funding shifted $7 billion towards previously underrepresented counties. The stark reality of racism in this country is that it serves to undermine democracy. In a famous 2002 study, Christopher Uggen and Jeff Manza find that felon disenfranchisement has influenced the outcome of numerous Senate races and at least one Presidential election. They estimate that 35 percent of disenfranchised felons would vote in a presidential election, and 20.5% in a midterm election. In the 2014 election, Michael McDonald estimates that 3,445,233 felons were disenfranchised. Although opposition to felon disenfranchisement has traditionally come from the progressive side (Hillary Clinton has long opposed the practice) some conservatives, like Rand Paul, are starting to join the ranks.